Feedback is a wonderful thing, when you can understand it. When you can’t… To quote Captain Jack Sparrow, “Well that’s even more than less than unhelpful.” You get the idea. Think back to the last time you got feedback on something. Maybe it was suggested revisions for a project or the survey responses for how you did during a speaking engagement. Or maybe it was storyboard revisions for eLearning. What did it say? disagreements. Ultimately, feedback needs to provide directions and suggestions or point out something that isn’t working well. If a comment doesn’t do any of those things, it’s probably not going to be very helpful. 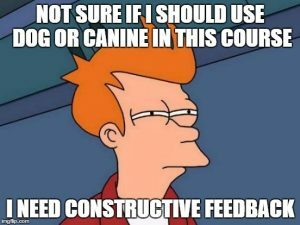 Luckily, we can learn how to give good feedback. Here are some quick tips. To recap, feedback is better than no feedback. Clear feedback is better than confusing feedback. Confusing feedback is, sadly, quite common. Feedback’s quality can be improved by following best practices. If you’d like to read more about instructional design best practices, check out the rest of this author’s blogs. Ready to find out what Digitec can do for you?